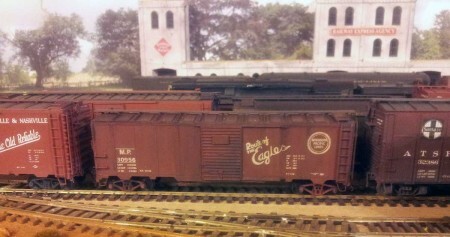 A Southern Pacific B50-15 box car produced by Sunshine Models. 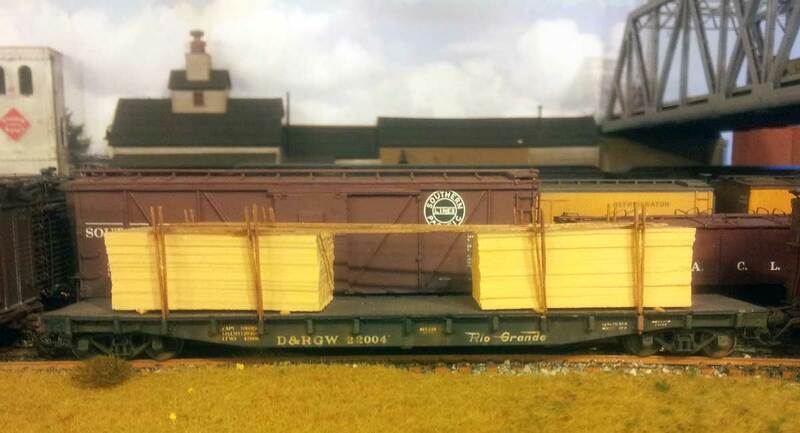 Paul Doggett has been sharing images of his completed resin freight car builds on Facebook and the resinfreightcars YahooGroup. We asked him for a little background on his inspiration and work, since he lives across the Atlantic Ocean. Click on any image here to review a larger size. You can blame Ian Clasper for my models. I met Ian at a British NMRA meet. He arrived at the carpark on a rather nice Triumph Tiger 100 motorcycle which we got talking about. Then he opened his top box and produced Kadee product boxes but not with their PS1 cars. 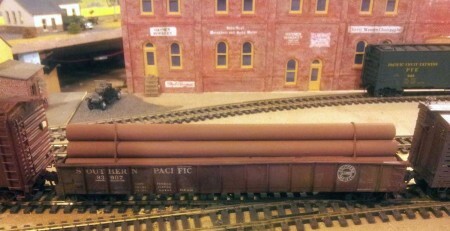 Ian had rather exquisite resin box cars, mainly Sunshine Models, in these Kadee boxes. That really got me interested. I arranged with Ian or Barry Bennett to collect six kits from Martin Lofton, which he had kindly agreed to take to Napierville or an NMRA convention, and Ian or Barry collected them for me. I have also dealt with Al Westerfield, Ted Culotta, Funaro and Camerlengo, and Rocket Express. I even got hold of a Dennis Storzek Soo Line saw tooth boxcar and a D&RGW flat car by Byron Rose. The one manufacturer I have yet to try is Yarmouth Model Works. A D&RGW flat car kit Bryon Rose once offered. I have no secret methods to building resin kits. I try to include everything, even the train line (although it’s not always possible). I do tend to follow the manufacturers instructions although one or two do leave a bit to be desired. A few years ago, I sold off most of my American models. The resin kit builds sold quickly. I had a go at the British steam era but found it boring after a couple of years and the American steam bug bit again this happened at a time when Ian Clasper was working in the States and he was building a British coal mining model. So a deal was struck in which I bought British kits for Ian and he paid for them in resin kits. These were mainly east coast roads but there was also a Northern Pacific reefer from Norwest Kits. I recently completed this Norwest kit, thanks to some advice from Bill Welch. A Southern Pacific G50-13 mill gondola that was produced by Speedwitch Media. Barry Bennett also helped out with some spare kits. Like I say, I really cannot offer any shortcuts or useful tips. I have been a modeler for many years having built many British locos, passenger, and freight cars, as kits and scratch built, in both O scale 7mm/ft and OO 4mm /ft, so I do have a fair bit of experience in building models. 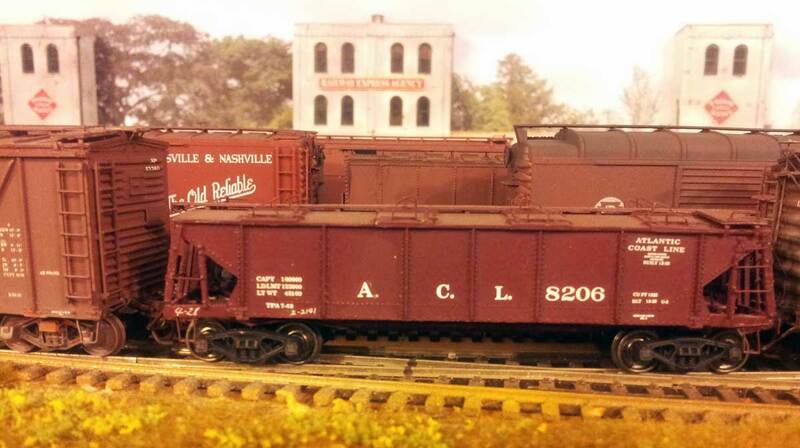 Westerfield’s Atlantic Coast Line phosphate hopper. The hardest kit I found was the Westerfield Atlantic Coast Line phosphate hopper. The corner posts were not easy being made up of a piece of 1×4 and 1×3 to make a 4×4 angle. I built this car for two reasons. First, I liked the look of it. Second, it was a challenge. I know this car would never get to the Southern Pacific that I model, but no one has ever said anything. The thing with resin kits is it’s like a disease. Once it bites you, you just cannot get rid of it. Mask Island decals finished off this Funaro & Camerlengo box car kit. One or two people remark on how quickly I build resin kits. At 68 years old and many kits to build, I can sit with the wife while she watches the television or reads and I build my kits. For a change, I may build a plastic kit, rebuild a brass loco, or get on the bike and go for a blast just to clear the mind. Thanks to Paul for his personal kit build summaries and insight from afar. Questions and comments can be posted below. Please follow the instructions so your comment can be posted. All comments are reviewed and approved before they appear. Obviously, you enjoy building resin kits, as do I. For a real treat, DO try a Yarmouth kit. Suggestion: The NP double sheathed box car should fit into your program nicely. Jim i do but at the moment i have just ordered two kits from Ted Cullota and this week and next its the Royal British Legion poppy appeal as a member i am collecting for our veterans. I will make enquiries in Nov as i am not sure if they take paypal the site says that they only take checks. Which living in the UK makes it awkward.